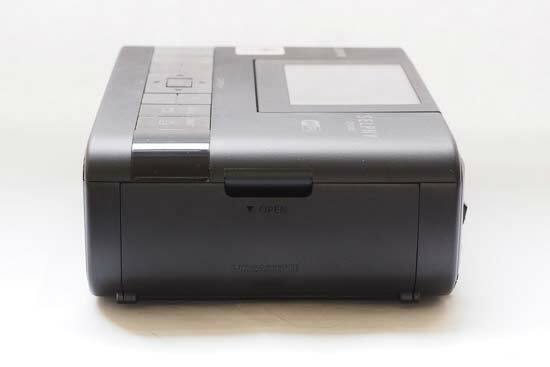 The Canon SELPHY CP1300 is a new compact photo printer from Canon, which is the successor to the SELPHY CP1200. It is capable of producing postcard sized prints (6x4 inches). 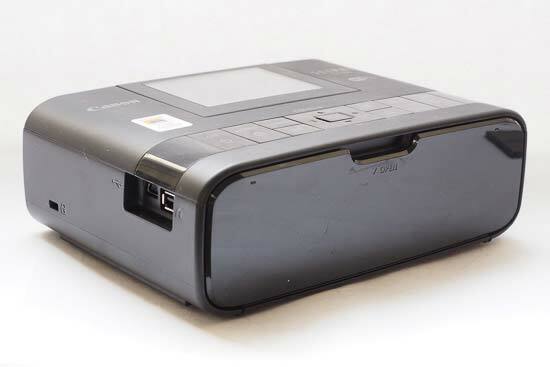 Like the CP1200, it is wireless, meaning you can print from devices connected either to your home network, or to the printer directly. This includes computers, your phone and your camera. In the box it comes with a power supply cable, but you can purchase a battery separately so that you can use it portably without having to be near a power point. At the moment, the Canon SELPHY CP1300 retails for around £127 / $130. Paper and ink packs for the printer cost around £27 for 108 prints. 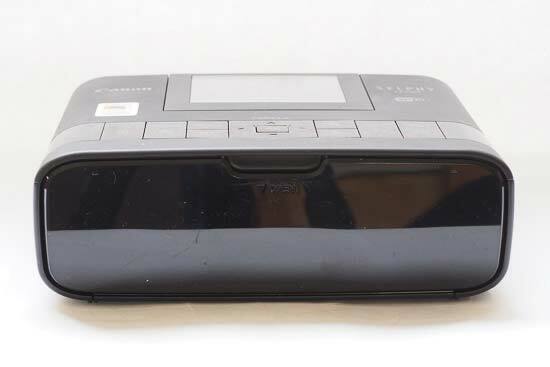 Setting up and using the Canon SELPHY CP1300 printer is very straightforward, and you can be ready to go very quickly indeed. 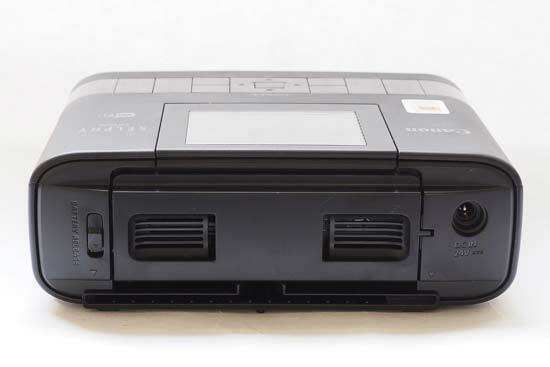 You can load the ink cassette in the side of the printer, behind a door which conceals it. It’s literally a case of sliding it in, facing the right way - which should be reasonably obvious since it won’t fit if it’s facing the wrong way. At the front of the printer, you’ll find the space for the paper cassette. This is slightly more complicated than the ink cassette, but easy enough once you get the hang of it. There are two covers which need to be opened, and the paper placed inside it. It can only hold 18 sheets at a time - which is handily how many are found in individual packs supplied in the 108 sheet pack we were using. 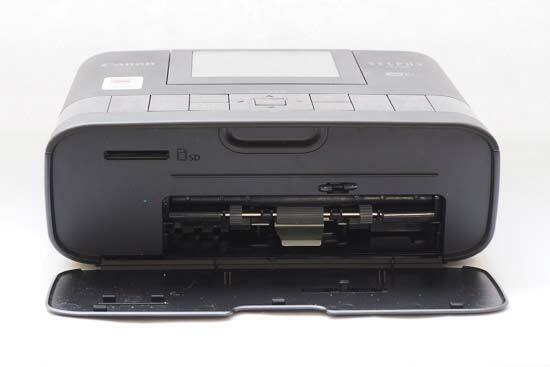 The glossy side of the paper needs to be inserted facing upwards - once you’ve done that, close the inside cover, but open the outer one - this allows you to insert the cassette into the relevant slot in the front of the printer. If you’re using the supplied power cable, you plug this into the back of the camera. Alternatively, attach the battery pack - this is available to purchase separately, and as such, we were not provided with this to test. Once plugged in, hold down the power button on the top of the printer. One of the improvements from the CP1200 is the size of the LCD screen on the top of the printer, which like before, can tilt forwards to help you to see it better. It is now 3.2inches - compared with 2.7inches. Sadly, it’s still not touch-sensitive, so you’ll need to make use of the buttons on the printer to move around the various menu options. When it comes to printing from the Canon SELPHY CP1300, there’s a few different options. 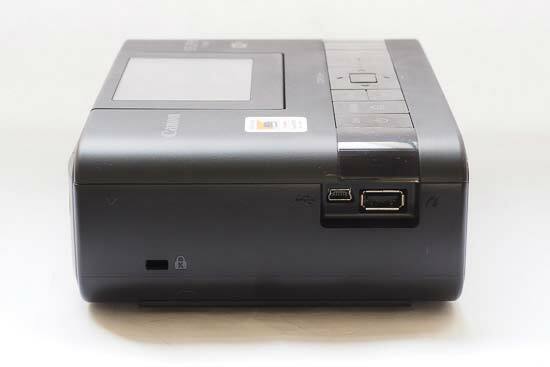 There’s an SD card slot in the front of the printer, or a USB port on the side, from which you can print directly. This is great if you just want to make a quick print from your camera. Once you’ve inserted an SD card, you’ll see the images from it displayed on the screen. You can use the directional keys to move through the different images on the card, selecting which ones to print, and changing any settings you wish to. Alternatively, you can set it up as a wireless printer. Probably the best option is to set it up so it’s connected to your home Wi-Fi network, which will mean that you can print to it from a device which is also connected to the same Wi-Fi network, such as your computer, your phone, or indeed your camera. To set it up in this manner, you’ll need to go to the Wi-Fi settings area, found under the Menu button. You’ll be directed through the steps you need to follow to set it up, which is pretty self-explanatory and straightforward. 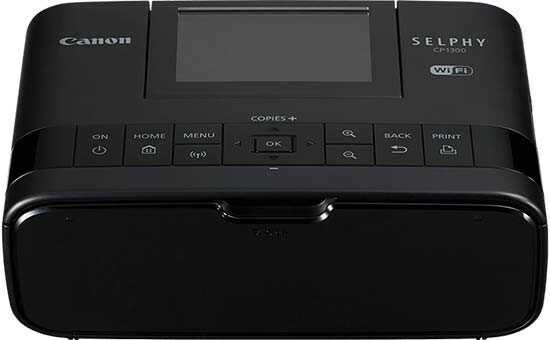 If you prefer, you can connect directly to the Canon SELPHY CP1300 itself to print that way. This is useful if you don’t have access to the Wi-Fi router, or for example if you’re using it while out on a shoot and just want to print something from another device - this means you don’t need a router or any other equipment to use it. The CP1300 is compatible with Apple AirPrint, so if you have an iPhone, you can send an image from it very easily to be printed on the CP1300. Canon says that postcard prints take around 43 seconds to print. 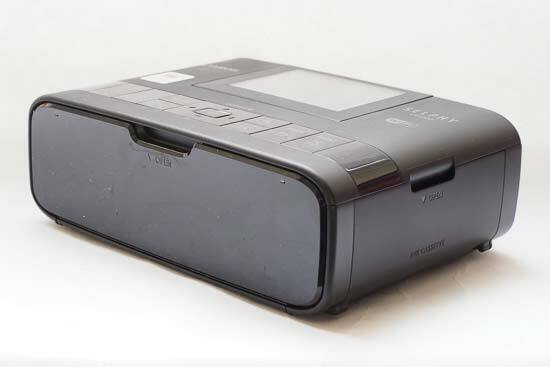 In our tests, we found that in total from pressing the print button on the phone or computer, to having the image finished, is just over a minute or so - this extra time may be due to the wireless connection taking a while to transfer the data, as well as paper handling. Printing directly from an SD card is quicker - usually around 50 seconds (including paper handling). As we mentioned in our CP1200 review, watching the printing process is quite fascinating. The printing process involves applying the colour in layers separately, meaning that the paper will be drawn into the printer, then spat out once it’s applied the first layer, being drawn in again three more times before it’s finalised. You’ll need to ensure there’s space behind the printer, as it moves back and forth from the front to the back several times. You’ll see the screen display which layer it’s printing, and once it’s ready, the final image will rest in the paper tray. If you’ve got a memory card or USB stick inserted, you can choose to print all the images in one go, or you can choose to print more than one to a page - you can fit up to 8 on one page, which can be fun for creating a collage type effect. There’s also four different printing finishes available, plus you can choose to print with or without a border, switch image optimisation on or off, adjust brightness, colours, add skin smoothing, correct red-eye, add a date stamp, a file number and so on. 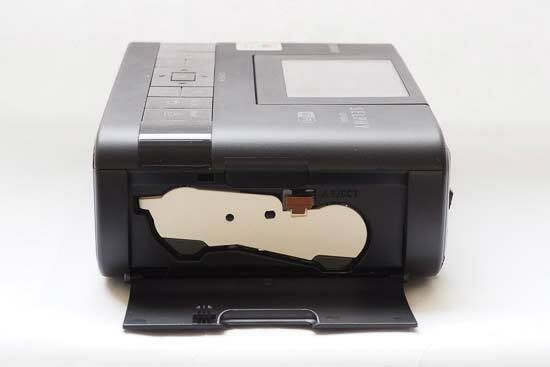 There’s also other options available, such as Auto Power Down, which can be especially useful if you’re using the printer with a battery. A new feature for the CP1300 is “Shuffle Print”. 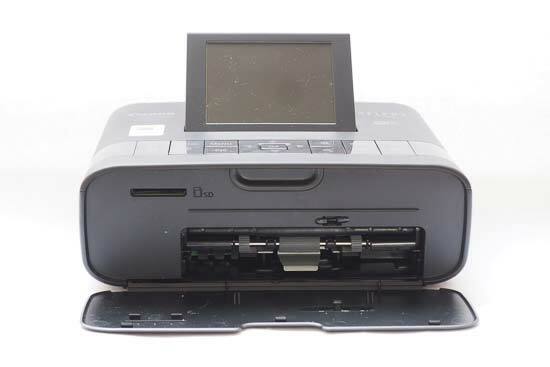 This basically means that multiple mobile devices can connect to the printer at once in order to print onto one sheet of paper - which an be a fun way for a family to print their shots. We were supplied with a combined ink and paper pack, which has 108 sheets inside it. At the time of writing, this was available to buy for £26.73 from Amazon. This makes it around 25p per print, excluding the cost of buying the printer itself. As we’ve noted before, the print itself will feature two strips on either side which can be folder over and torn off. This is to ensure that the print goes all the way to the sides, but if you simply fold the strips and leave them attached, you can use them as a make-shift stand, meaning the photo will stand up on a flat surface. When the paper has run out, you’ll of course be able to see that there’s none left in the cassette, but there will also be a warning message displayed on the screen. As for the ink cartridge, there’s no way to see when this is about to run out, but again, there will be a warning displayed to show you when it has. It would perhaps be helpful if it was displayed on the screen the number of prints you have left in your current cassette. Overall, the Canon CP1300 is a very easy device to use, allowing you to get started straightaway, with extra options available to explore as and when you need to.